The Breg Volley Tennis Elbow Strap is a highly versatile brace that provides compression to the forearm. Included with the brace is a gel puch for targeted pressure and also an air pouch for pneumatic compression. The Breg T Scope Premier is expertly designed for a fixed or controlled range of motion in treatment of ligamentous injuries and stable fractures of the elbow and upper arm. This is an off-the-shelf brace incorporated with T Scope premier hinge and telescoping uprights. Made for exceptional patient fit and compliance. Tennis Elbow Support with Hot/Cold Gel Therapy for pain due to epicondylitis. The Ossur Airform Tennis Elbow Support offers a focused pneumatic compression to provide more support with less constriction. The Ossur Premium Padded Arm Sling is a blue envelope style arm sling with canvas material. The Hely Weber Basic Elbow Sleeve is made of 1/8" Neoprene with a 2-sided nylon outer covering. The Basic Elbow Sleeve provides compression, padding and warmth to the elbow joint. Anatomically designed for a custom fit. 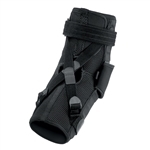 The DonJoy Elbow Guard is a lightweight soft good with rigid elbow protection. Designed by medical professionals with your needs in mind. Provides elbow stability for mild to moderate medial/lateral and hyperextension injuries. The DonJoy Spider Elbow Pad utilizes a unique honeycomb design contours for comfortable movement while providing cushioning protection designed for basketball, football and volleyball. The Hely & Weber Hayes Padded Orthosis (Wrap-Around) provides comfort for Tendonitis, Bursitis, Cubital Tunnel Syndrome and Arthritis. The Hely & Weber Matt Strap Shock Absorption utilizes a unique composite buttress of foamed silicone and a spectron non-slip backing. Matt Strap provides focused compression over the buttress. The EpiPoint elbow support relieves pain in the tendon such as in the case of tennis elbow ( or golfers elbow ), known as epicondylitis lateral, and similar muscle and tendon irritation or inflammation. Its elastic pressure pad relieves pressure. An elbow injury can be something mild, like tennis elbow or a minimally invasive surgery, or something more major, like a serious injury to the joint. Whether you need an elbow brace to help reduce pain, compress the tissue, or to reduce inflammation via cold therapy, Shop-Orthopedics has every piece of equipment you need. We have slings, bands, compression tools, braces, and more to assist with whatever your elbow problems may be.